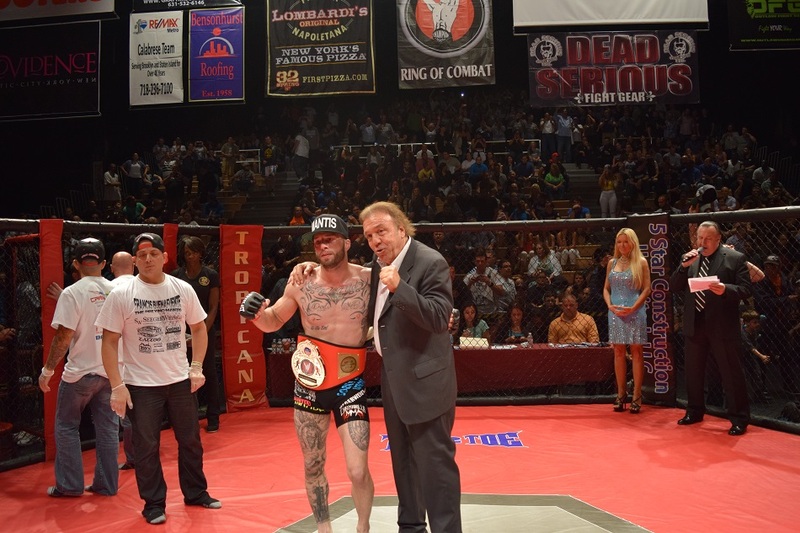 In the first of three title bouts at Ring of Combat – ROC 55 from the Tropicana in Atlantic City, New Jersey, June 3, Frankie Buenafuente (145-pounds) defeated Jose Mariscal via unanimous decision to claim his first championship. The Mantis, used his trademark wrestling skills to control the fight and his striking was also effective as he took the first 2 rounds. Mariscal battled back, including a couple takedowns of his own, to take the third round. This fight was non-stop action for the full 15 minutes and had the crowd on their feet numerous times. Brilliant effort from both as the judges all saw it 29-28 for Buenafuente. The “Viking” Eric Roncoroni is a name you should get used to hearing. 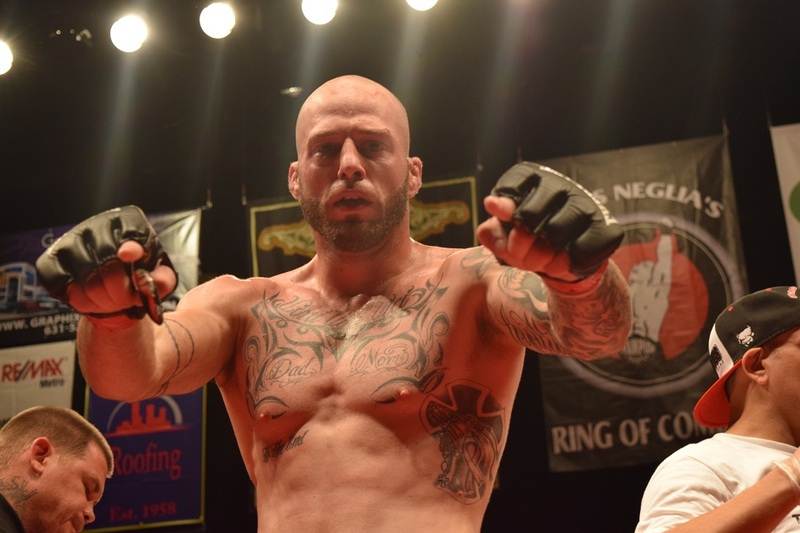 Roncoroni blasted Mike Elshamy with several knees and landed a hellacious one, 1:10 into round two that had Elshamy out before he hit the cage floor. The Viking fights to finish, and last night was no different. He fended off numerous takedown attempts and threw a variety of knees, kicks, and combinations to soften up his opponent before scoring with the highlight reel KO with the knee to win his first title and now wears the ROC 185-lb strap around his waist. His future is very bright. For the first time in seven pro fights, Gregor Gillespie (155) was finally tested as Sidney Outlaw took him the distance for a split decision. Outlaw’s corner, Dante Rivera, had a masterful game plan that almost resulted in a huge upset. In round 1, Gillespie scored several takedowns but Sidney was able to get back to his feet each time. Near the end of the round, Outlaw pulled a reverse and had the back of Gillespie. Time ran out as he tried to lock in the RNC. Round two was much of the same with Outlaw scoring in some of the stand-up exchanges, as Gillespie used his elite wrestling to score takedowns when he needed to. Outlaw continually battled from the bottom and reversed the champ several times in what was a back and forth battle. Round 3 was just as exciting as both fighters exchanged scoring combinations and some takedowns. A brilliant game plan and execution was not enough for Outlaw to overcome the sheer will of Gillespie, who now that he’s been challenged, can go back and look at the film and do some self scouting to tighten up his game because the UFC should probably be calling on him soon. Jimmy Spicuzza (155) earned a hard fought split decision over Max Bohanon. Spicuzza did a tremendous job of defending several submission attempts from Bohanon and looked outstanding on his feet. Another great match-up that went to the judge’s scorecards. Mike Trizano is a huge prospect at 145 and he took care of business with a RNC submission in round 1 over Raul Gonzales. S Aydarbekov (135) won a close fight over Drew Aguilar, who took the fight on 4 days notice. It was one of those fights where I said to myself, I’m glad I am not a judge! Very close fight and major props on the short notice performance of the very professional Drew Aguilar. This was once again, another card loaded with top tier MMA talent and several fighters who could make the UFC in the near future. Lou Neglia continues to entertain fans and provide a marquee promotion to allow these warriors to perform at what they love to do. I look forward to his next event!